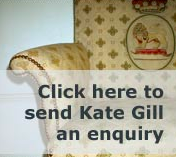 Kathryn (Kate) Gill has 30 years experience in textile conservation and upholstery conservation. An accredited conservator (ACR); a Fellow of the International Institute for Conservation (FIIC); a Fellow of the Higher Education Academy (FHEA). Kate worked at the Textile Conservation Centre (TCC), UK and at the Metropolitan Museum of Art, USA. Conservation of all types of textiles, especially complex multi-media objects, including traditional and modern upholstery, furnishing textiles. Extendened documentation reports. See portfolio section for a selection of recent conservation projects. Available for on site work in historic houses and museums. Collection surveys, conservation strategies, display, storage. Short courses (career entry and CPD), lectures series and one-off lectures. Presenting a 'behind-the-scenes' view of conservation. Learn more about Kate Gill services.